Apparently this weekend is the weekend most people will quit their New Years Resolutions. It is perfectly normal to hit a plateau when attempting to make changes in your life and it is usually around the three to five week mark that the initial excitement and motivation will wear off. So here are just a few tips to deal with boredom and keep going with the changes you want to make. Don’t beat yourself up if you are struggling. All this will do associate that negative feeling with the goal you want to achieve and utterly destroy an vestiges of motivation you had left. 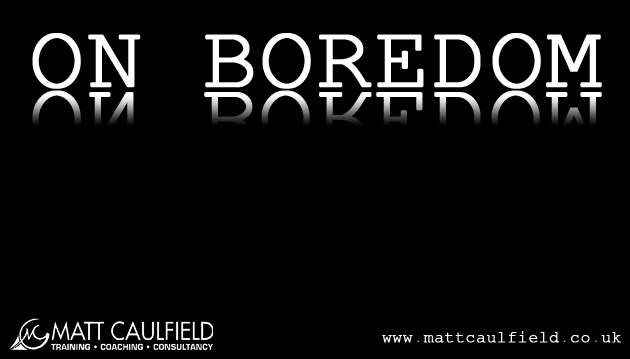 Accept that boredom is a perfectly natural part of the process and that, even with things we love doing, we get bored, frustrated and disinterested at times. Just relax, don’t fight it, it will pass. Just because you take a break doesn’t mean you have failed or given up, it just means you are having a break. Even The Rock has cheat days where he eats rubbish (and most fitness experts I have spoken to advocate having a “cheat day”). Make a deal with yourself to take a few days off and then get back on with it. In fact, BAN yourself from doing anything even remotely associated with achieving your New Years Resolutions for a few days. An enforced break can often have a counter effect of making you want to do it even more (it is a bit like telling people not to think of orange penguins – the first thing you do is think of orange penguins). What can you do to mix it up a bit? If you are trying to get fit, can you change your routine? Change the time of day you are doing it? If you are eating more healthily, try different recipes for food. If you are attempting a new skill, just change how you are going about it. Maybe try a more advanced part of the process, you may surprise yourself and be better than you thought. Take a few minutes to go back to why you began. Maybe you have an idea of a goal or a time you want to achieve that goal by. Just sit down for five minutes and remember why you started this in the first place. As you start to make a mental representation of why it is you are doing this, notice all those good feelings and sensations. Do this for a few minutes a day (maybe whilst taking a break – see above) and you will be surprised how motivated you become to carry on. How To Think Like Sherlock Holmes NLP VideoBlog Episode 25: The Importance of Tone?